In announcing the review, which is due to be completed by Easter, the Foreign Office acknowledges that ministers have failed to offer the same level of support as to other persecuted minorities. “Britain already stands up for minorities across the world, including Jehovah’s Witnesses and Yezidis, and the foreign secretary is keen that Christians are offered the same level of backing,” an official said. It will be specifically directed at the persecution of Christians, and not religious minorities in general, reflecting the foreign secretary’s view that since Christianity is the established faith in the UK, it is legitimate for the state resources to be devoted to the review. When the government of India is allowing violent attacks to take place against Christians, and an extremist group linked with the leading political party is actively trying to wipe out the church, it isn’t surprising that Christians in India are facing horrific levels of persecution. Open Doors church partners estimate that almost 24,000 Christians were physically attacked last year because of their faith. Why is the UK Government rewarding religious cleansing with £98 million in aid, which basically covers the cost of India’s new £95.4 million lunar probe Chandrayaan-2? Surely the Bishop of Truro will understand that UK aid given to nations which persecute Christians effectively amounts to Christians subsidising the persecution of their brothers and sisters in Christ? Why do we give any aid at all to those governments which do not respect the fundamental freedom of religion and belief? If the concern is diplomatic influence, is it not worth asking why Iraq, Yemen, Iran, Saudi Arabia, Egypt, Nigeria, Libya and India have such little respect for diplomatic relations with the UK that they persecute Christians and seemingly don’t give a damn what Her Majesty’s Government thinks or says? The danger, of course, is that by withdrawing aid, ethnic and religious tensions are inflamed and more martyrs are added to the global slaughter. And this is what Bishop Philip needs to weigh carefully, for his report is likely to set the FCO’s policy until 2022, if not beyond. Get this wrong, and more Christians will die for believing in and walking with Jesus Christ. Get it right, and more saints will be saved. So let the ensuing chat thread contribute to the process of discerning wisdom. How should Jeremy Hunt act to better reconcile the secular-political FCO with bearing witness to God’s justice? How might the Bishop of Truro nudge the FCO community toward greater understanding of the meagreness of their current policy, and the moral imperative of using its cultural and economic influence to ensure justice and freedom for Christians in particular? How should the UK Government bear the sword to execute God’s wrath upon Christ’s persecutors and enemies, in order to secure mercy and compassion for believers? What good should be returned for this evil? 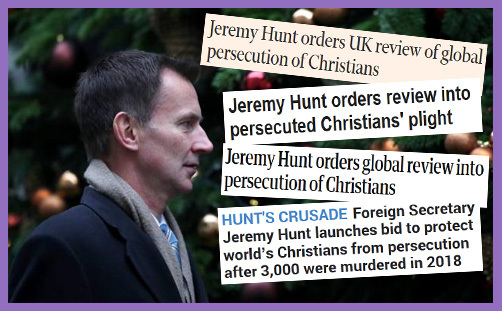 If our struggle is not against human adversaries, how do we open Jeremy Hunt’s eyes to the spiritual forces of darkness, and persuade the FCO that its armour and weapons are truth, righteousness, peace, faith, salvation and the word of God? Perhaps the Rev’d Jonathan Aitken might be appointed Chaplain to the FCO, or given some formal advisory role? Certainly, his Christmas sermon appears to have been (encouragingly) expeditiously efficacious.